The Greater Florida LEGO® Users Group (GFLUG) was formed in summer of 2000 for the sole purpose of giving Adult Fans of LEGO® (AFoL) a way to express their unique hobby. Over the years we have displayed at numerous model railroad shows, art festivals, Disney conventions and sci-fi conventions as a group. GFLUG does not favor one form of the hobby over any other, giving its membership a wide range of exposure. The primary goal of the group is camaraderie that is achieved by providing members the opportunity to meet other adults who share a common fascination with the LEGO® hobby through correspondence, meetings and events. We are a family oriented group with member's spouses and children helping at select events and enjoying the fruits of our building labor. For information on joining our group see the Membership Information page. If you have a question go to our Contact Us page. Construct and display LEGO® models for the enjoyment of the general public and the membership. Demonstrate the endless capabilities and creativity that can be achieved by building with LEGO® bricks. Concentrate wholesome family fun; by displaying LEGO® models as a hobby that can be enjoyed by adults and their children. - Provide a place for Adult Fans of LEGO® (AFoL) to meet and share ideas. - Provide members a chance to display their creations. - Promote building with LEGO® bricks as a hobby in the state of Florida and around the world. Create environment for the exchange of ideas, information, and skills relevant to LEGO® brand of building bricks and to promote the hobby. Be an active group of delegates to the public and the LEGO® Company, by displaying the endless possibilities of LEGO® brand of building bricks. - Maintain an on-line presence though the web sites, news letters, news groups, blogs, etc. - Conduct group meeting on a regular basis. 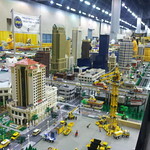 - Operate public LEGO® displays around the state and the country. 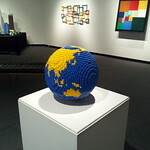 - Attend other related LEGO® and Hobby events around the world. GFLUG started with Robin W, Mark K and KK Q back in the Summer of 2000. They held the first GFLUG meeting at Mark's place and talk for at least an hour about forming this group and building with LEGO® bricks. Today the group has an ever growing membership and meets/displays at numerous events around the world. The Greater Florida LEGO® Train Club (GFLTC) is a Special Interest Group (SIG) within GFLUG. The train club formed in October of 1999 and merged with GFLUG in 2010 to simplify operations. The two groups were pretty much sharing events, members and assets the merging of them made thing less cumbersome. 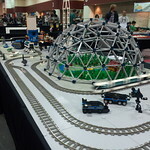 The Greater Florida LEGO® Train Club started when Dennis C and Nick M discovered Robin W displaying his LEGO® Trains at the H & R Trains Show back in the Fall of 1999. They talk for at least an hour about LEGO® Trains and displaying at train shows. Just a few weeks later they met again, picked the club name and set the basic ground work for the train club. 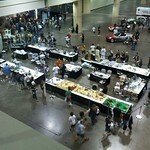 By December of 1999, they did their first public layout as a club at the Great American Train Show (GATS) in Tampa, Florida and it was a big hit for all and was great fun. In the year 2010 the club has merged with GFLUG and displays as a Special Interest Group (SIG) at numerous train show around the state of Florida and the country.